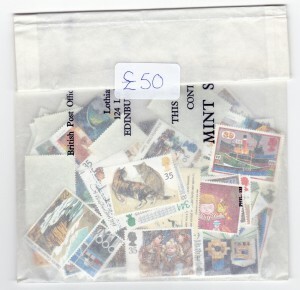 Offered at approx 70% of face value lucky dip bags of decimal face stamps. Who knows what you will find in each bag as we see booklet panes, prestige panes, commemoratives, defins all UM and ready to go for your mail. Dennise has bagged them up as £50 face value bags priced at just £35 each. That’s the equivalent of posting an additional 22 letters free of charge! Hurry as we only have about 50 units (so many different stamps in each bag).